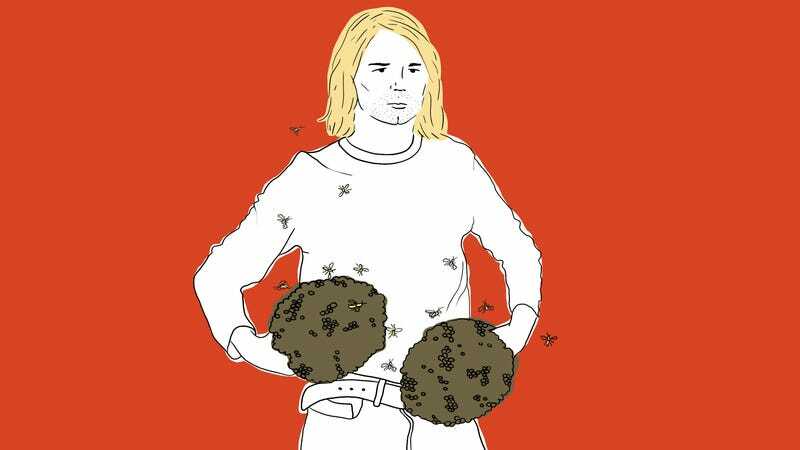 Since his tragic death in 1994, Kurt Cobain’s fans have wondered about all the great things he could’ve achieved had he lived, but now thanks to one amazing painter, it almost feels as if the singer is still with us: This artist imagined what it would be like if Kurt Cobain had lived long enough to get both his hands stuck in beehives. Wow. What a powerful glimpse into what might’ve been. Visual artist and lifelong Nirvana fan Joanne Bredesen made the touching tribute to Cobain after realizing that it could be comforting for people to see what it might look like if the late rocker hadn’t died but had instead gone on to do excruciatingly painful things in order to satisfy his desperate craving for honey. She wanted to create a portrait that not only honored the singer’s legacy, but also helped provide closure to the millions of fans who never got to see him agonize over how to free himself from the thousands of angry bees he’d provoked, and the result is incredible. It’s a bittersweet, haunting depiction of the man Kurt Cobain never got the chance to become, and Bredesen’s attention to detail is stunning. From the resigned expression on the singer’s face as he realizes help won’t come, to the distressed fluttering of the bees’ wings as they defensively sting him in confusion, she has beautifully rendered a world where one of the greatest songwriters of the past century has lived long enough to realize his true potential. Close your eyes, and you can almost hear the amazing music that having both hands stung thousands of times in an ill-conceived gambit for honey would’ve inspired. What a stirring tribute to an artist who left us far too soon. While Cobain sadly didn’t live long enough to get his hands stuck deep in beehives and run panickedly around the woods screaming, “Ouchie, ouchie, me no likey!” this painting lets us—if just for a moment—believe that he did.